You are here: Home / Events / Burkhart is honored to be recognized as a Gold Achievement level Fit Friendly Worksite! 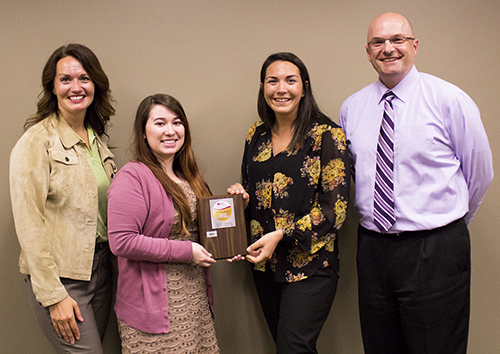 Burkhart is honored to be recognized as a Gold Achievement level Fit Friendly Worksite! We are honored to announce that Burkhart Dental Supply has been recognized by The American Heart Association as a Gold Achievement level Fit Friendly Worksite. Companies must meet several qualifications including implementing at least six of the physical activity criteria, two of the nutrition criteria and one of the culture criteria listed on the application form. Burkhart’s wellness program encourages associates to stay active and eat right. As a company we understand that staying active increases productivity and helps employees live healthier, longer lives. A big thanks goes out to the American Heart Association for this recognition and to our Wellness Team for always encouraging our associates to live healthy, balanced lives.